The owl has been made significantly more owl-like as part of our big conservation project: Fluff It Up: Make Taxidermy Great Again. This project aims to treat our historic taxidermly collection by cleaning and repairing some truly uncollectable specimens that have been slowly deteriorating over the many decades since the animals died. 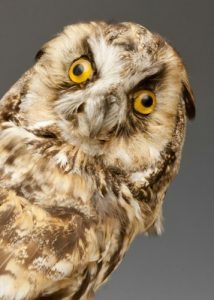 The owl was one of the first to be treated – by expert conservator Lucie Mascord – and the work was actually undertaken in the museum gallery so our visitors could experience what such intricate work involves. 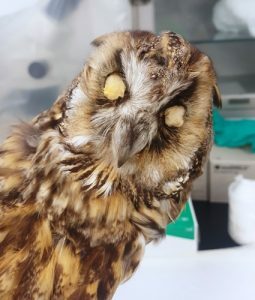 We had long discussions about the ethics of “correcting” the owl’s eyes, because specimens in museums not only tell a scientific story of the species they represent, but also the history of how they came to be, and the the people and cultures they come from. That conversation is the focus of my last post, but the final decision was that this owl was merely poorly made, and did not represent a significant step in our understanding or communication of owls. We felt that he would be more useful to the world if he looked more like an owl. Eyes are often the bit that betrays a taxidermied animal – the thin skin around the sockets can pull back, or the taxidermist fails to sink the replica eyes deep enough into the head. Sometimes – as in our googly-eyed owl – they stick them on the outside of the skin, rather than the inside. Lucie’s first step in conserving this specimen was to remove the dodgy teddy-bear eyes. The de-eyed owl. LDUCZ-Y1604. Image courtesy of Lucie Mascord. Aside from the eyes, there were other parts of the specimen that needed treatement. A number of the feathers were out of alignment, particularly the ones that give it its name: the long ears. 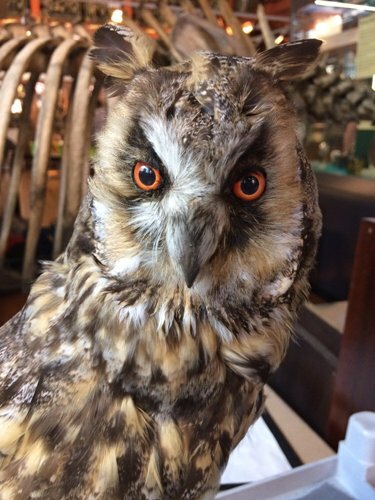 These aren’t actually ears, but feathery-tufts that the owl can erect in display. It was also a bit wobbly on his perch, putting unneccesary stress on the specimen’s legs. Fluff It Up: Make Taxidermy Great Again is running until September, when toy animals will be on display in place of specimens that have been removed for conservation. The Grant Museum of Zoology is open from 1–5pm Monday to Saturday. Admission is free and there is no need to book. Jack Ashby is Manager of the Grant Museum of Zoology and a NatSCA Committe Member. ← Stirring the hornet’s nest – are natural science collections even legal?